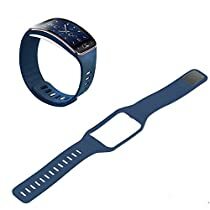 Large size replacement wrist band with clasp for Samsung Galaxy Gear S SM-R750 Smart Watch. Made of high quality material, fits comfortably around your wrist. Band Length: 10.2 inch (26cm). Suitable for Wrist circumference: 6.5" -- 9". Lightweight and easy to install. Replacement Wrist Band only, the Samsung Galaxy Gear S R750 Smart Watch is not included.